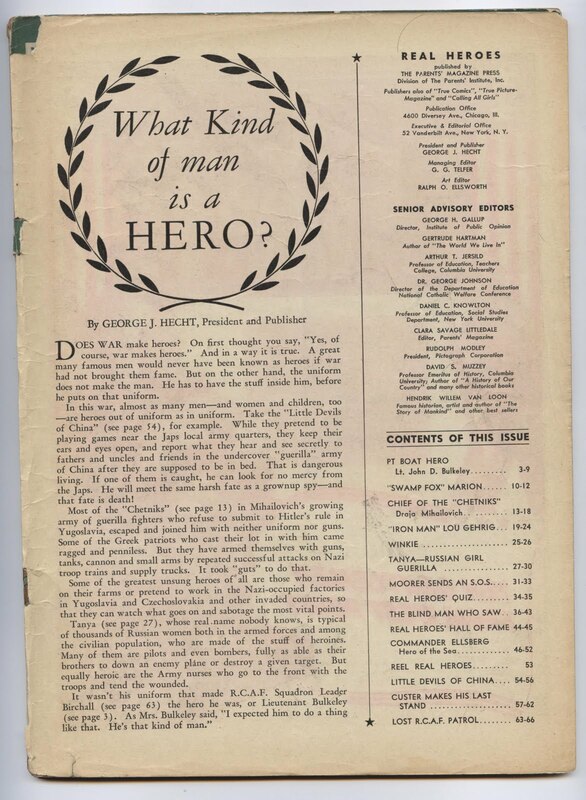 "What Kind of Man is a Hero?" "Real Heroes" Comics and Founder of "Parents Magazine"
"Does War make heroes? On first thought you say, 'Yes, of course, war makes heroes.' And in a way it is true. A great many famous men would never have been known as heroes if war had not brought them fame. But on the other hand, the uniform does not make the man. He has to have the stuff inside him, before he puts on that uniform. ...Most of the "Chetniks" in Mihailovich's growing army of guerrilla fighters who refuse to submit to Hitler's rule in Yugoslavia, escaped and joined him with neither uniform nor guns. Some of the Greek patriots who cast their lot in with him came ragged and penniless. But they have armed themselves with guns, tanks, cannon and small arms by repeated successful attacks on Nazi troop trains and supply trucks. It took "guts" to do that." 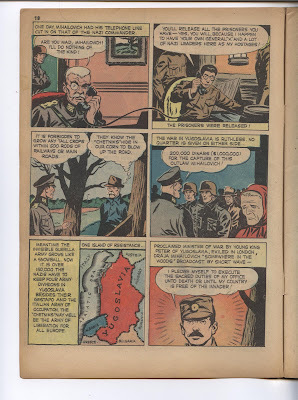 The Chetnik guerrilla resistance movement led by Draza Mihailovich reached superhuman dimensions in the U.S. during World War II. Indeed, his exploits became the stuff of legend, rivaling the superheroes in comic books. 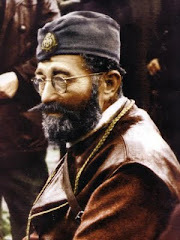 Draza Mihailovich himself became a comic book hero and the Chetnik guerrillas assumed the status of superheroes. Before television and mass market paperbacks, comic books were a dominant, mainstream form of entertainment in the U.S. The period from the late 1930s to the late 1940s became the Golden Age of Comics, a period when comic books proliferated the market. 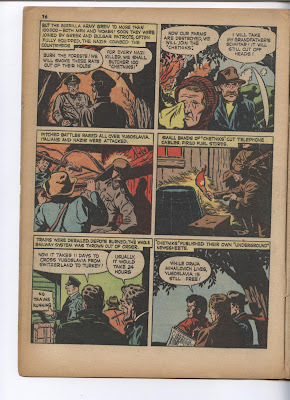 In the early 1940s, there were 125 different regular comic books published in the U.S. with sales of 25 million copies per month with a total yearly revenue of $30 million. The superhero archetype was developed during the 1930s with the appearance of Superman in June, 1938 in Action Comics #1 and Captain Marvel in the 1940s. 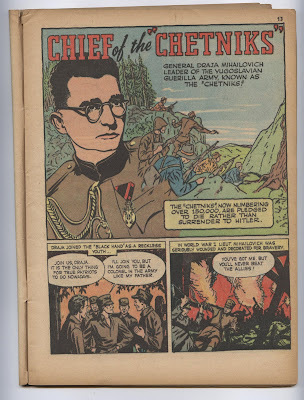 The first major appearance of Draza Mihailovich in an American comic book was in the September, 1942 issue of Real Heroes Comics, the cover story “The Chief of the ‘Chetniks’: Draja Mihailovich”, issue #6, published by the Parents' Magazine Press in New York. The comic book was about real-life people: "Real Heroes Comics ... Not about impossible supermen, but about real-life heroes and heroines who have made and are making history!" Draza Mihailovich, "Chief of the Chetniks", was across from New York Yankees icon "Iron Man" Lou Gehrig on the cover. The "V for ...Victory" symbol---three dots and a dash---was on the cover. A "v" in Morse Code is three dots and a dash. The V for Victory Campaign during World War II was a symbol of resistance to the Nazis and was tied into the first four notes of Beethoven's Fifth Symphony---G-G-G-Fflat. Real Heroes Comics was published every other month from 1941 to 1946 in 16 issues from September, 1941 to October, 1946. George J. Hecht was the Publisher and President. The Managing Editor was G. G. Telfer while the Art Editor was Ralph O. Ellsworth. George H. Gallup, the director of the Institute of Public Opinion, David S. Muzzey, Professor of History at Columbia University, and Hendrik Van Loon, the author of "The Story of Mankind", were Senior Advisory Editors. 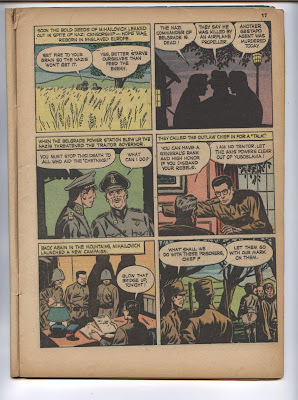 The Parents' Magazine Institute published comic books from 1941 to 1950. Some of the comic books they published were Calling All Kids, Calling All Boys, Calling All Girls, True Comics, Jack Armstrong, Polly Pigtails, Steve Saunders Special Agent, Tex Granger, and Real Heroes Comics. 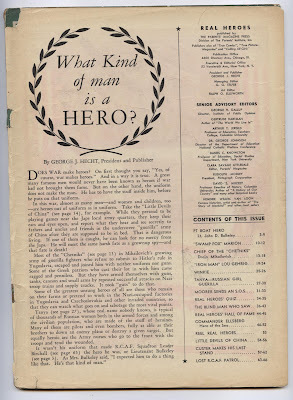 ‎In the essay "What Kind of Man is a Hero? ", publisher George J. Hecht emphasized that a hero possessed inherent human qualities that set him apart from others: "Does war make heroes? On first thought you say, 'Yes, of course, war makes heroes.' ... But on the other hand, the uniform does not make the man. He has to have the stuff inside him, before he puts on that uniform. ...Most of the 'Chetniks' ... in Mihailovich's growing army of guerilla fighters who refuse to submit to Hitler's rule in Yugoslavia, escaped and joined him with neither uniform nor guns. Some of the Greek patriots who cast their lot in with him came ragged and penniless. Bu they have armed themselves with guns, tanks, cannon and small arms by repeated successful attacks on Nazi troop trains and supply trucks. It took 'guts' to do that." ‎Many heroic acts go unreported and unseen: "Some of the greatest unsung heroes of all are those who remain on their farms or pretend to work in the Nazi-occupied factories in Yugoslavia and Czechoslovakia and other invaded countries, so that they can watch what goes on and sabotage the most vital points." 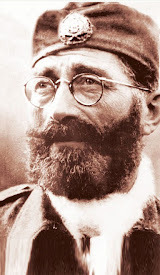 In "Chief of the 'Chetniks'", a large figure of Draza Mihailovich is drawn based on his 1937 photograph that became widely reproduced during the war with the description: "General Draja Mihailovich leader of the Yugoslavian guerilla army, known as the 'Chetniks!' The 'Chetniks' now numbering over 150,000, are pledged to die rather than surrender to Hitler." 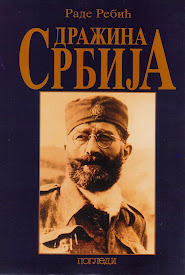 Draza's early career was recounted during World War I: "In World War 1 Lieut. Mihailovich was seriously wounded and decorated for bravery." Later Mihailovich joined the Yugoslav Army General Staff and was made a professor of strategy at the Belgrade military academy. His criticisms of Yugoslav defense strategy got him in trouble with the Yugoslav military authorities. Mihailovich, however, remained defiant: "Better to die than live a slave." After the German invasion and occupation in 1941, Mihailovich vowed to resist: "I shall never surrender! ... Not I! I shall resist my country's enemy until death." He formed a guerrilla army in the mountains. Spies revealed German troop movements and weapons shipments. Chetnik guerrillas "blew up the bridge and derailed the Axis troop train." The Nazis retaliated by shooting Yugoslav hostages and by shelling and bombing more than 40 villages. "But the guerilla army grew to more than 100,000---both men and women!" The German occupation forces decreed: "For every Nazi killed, we shall butcher 100 'Chetniks!'" 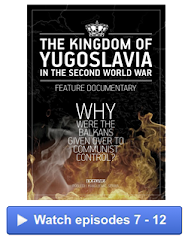 "Pitched battles raged all over Yugoslavia" as Chetnik guerrillas attacked Italian and German forces and "cut telephone cables" and "fired fuel stores". Trains were derailed and depots were burned. The guerrillas even published their own "underground" newspaper. The resistance grew. 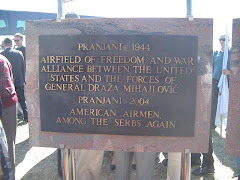 People exclaimed: "While Draja Mihailovich lives, Yugoslavia is still free!" As news of Mihailovich's exploits spread, "hope was reborn in enslaved Europe." 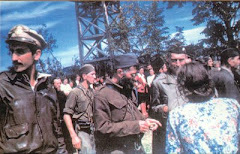 The guerrillas then blew up the Belgrade power station. The Nazis vowed: "Death to all who aid the 'Chetniks!'" Mihailovich refused to relent and continued sabotage operations, blowing up bridges. He freed German prisoners. He also forced the Germans to release their prisoners. The Germans placed a reward of "200,000 dinars ($1,000,000) for the capture of this outlaw Mihailovich!" He established "one island of resistance." Mihailovich remains a beacon of resistance to the Nazis: "Meantime the invisible guerilla army grows like a snowball. Now it is over 150,000. The Nazis have to keep four army divisions in Yugoslavia besides their Gestapo and the Italian army of occupation. The 'Chetniks' may well be the army of liberation for all Europe." Mihailovich is made Minister of War and in the final scene from "somewhere in the woods" transmits over the short-wave radio: "I pledge myself to execute the sacred duties of my office unto death or until my country is free of the invader!" 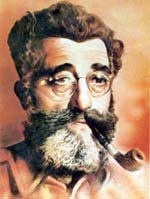 Draza Mihailovich next appeared on the cover of the November, 1942 issue of Real Life Comics. The publisher and editor of Real Life Comics, Ned L. Pines, was a major publisher of comic books during the Golden Age of Comics. 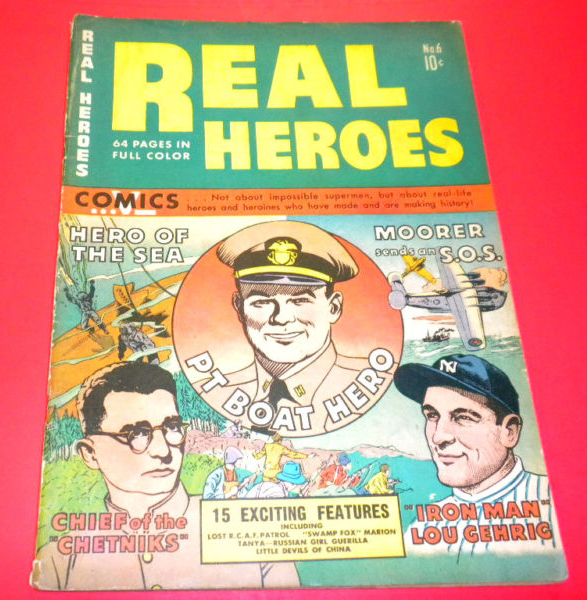 The comic book Real Life Comics was published by Nedor Publishing at 10 East 40th Street in New York City. It was a comic book series that ran from September, 1941 to September, 1952 for 59 issues. The covers were created by Alex Schomburg, one of the major comic book artists of the 1930s and 1940s. 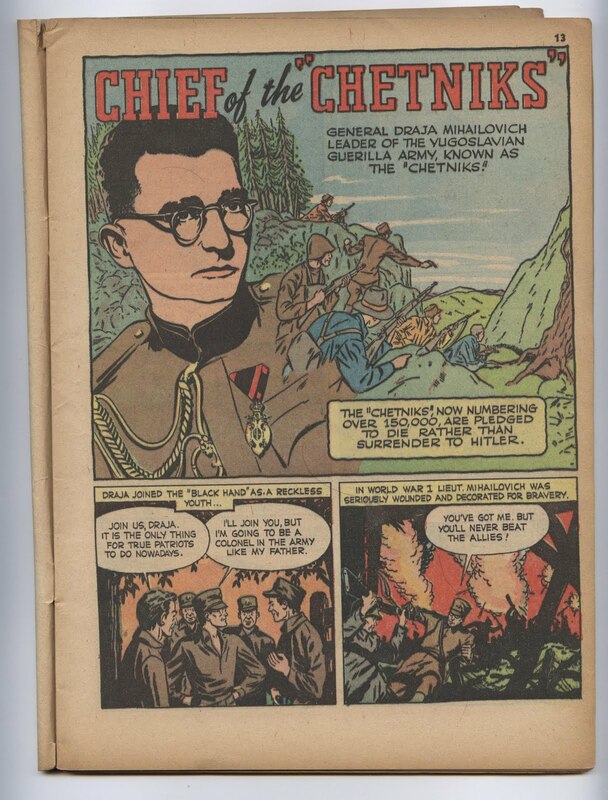 Pines also published Thrilling Comics, Startling Comics, Standard Comics, Better Comics, and Exciting Comics. 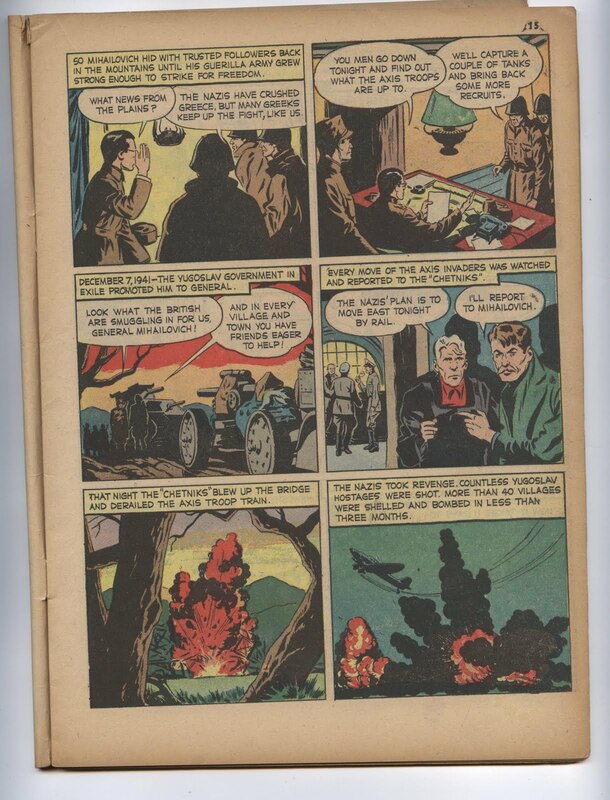 Pines also purchased Hugo Gernsback’s Wonder Stories science fiction magazine in 1936 and published it as Thrilling Wonder Stories and established the Popular Library paperback series in 1942. 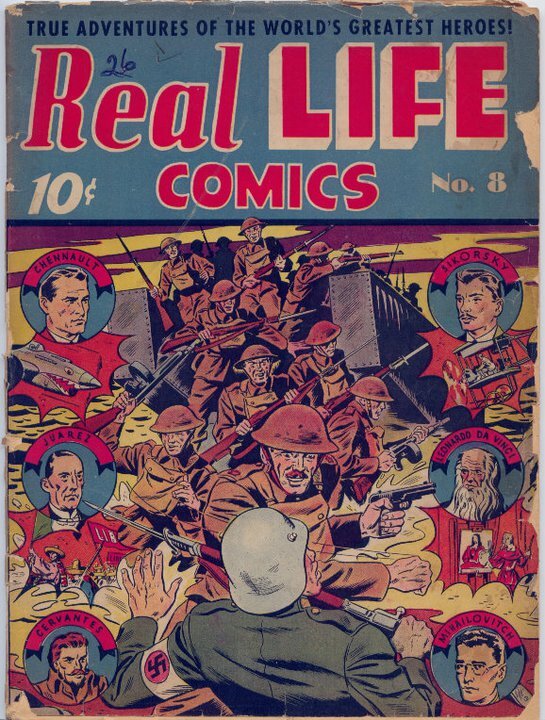 The comic book series Real Life Comics was published every other month and cost ten cents. The comic book featured real persons such as Leonardo Da Vinci, Igor Sikorsky, Claire Chennault, and Draza Mihailovich. Draza Mihailovich was featured in issue No.8 from November, 1942, Volume 3, No. 2. Mihailovich was also on the cover drawn by artist Alex Schomburg. 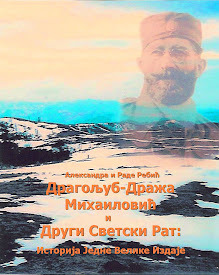 Mihailovich was in section 4 entitled “Draja Mihailovitch: The Jugoslav Hero.” The title of the story was “Draja Mihailovitch: The Yugoslav MacArthur”, comparing him to U.S. General Douglas MacArthur. 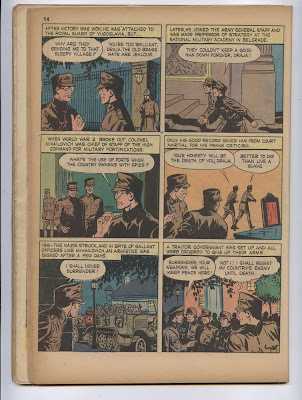 The story was introduced as follows: “Drawing upon a background of military education and diplomatic skill, the commanding officer of the Chetniks has held the hordes of Hitler and Mussolini at bay.” The issue also contained comics featuring Miguel Cervantes, Leonardo Da Vinci, Johnny Appleseed, Claire Chennault, and Benito Juarez. 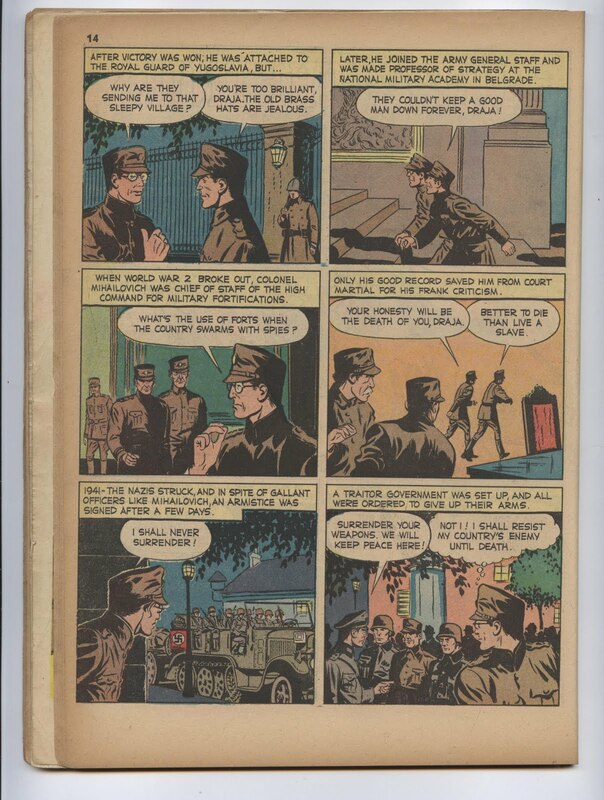 The comic recounted Draza Mihailovich’s service in World War I, his diplomatic assignment in Czechoslovakia in 1936 as the military attache, his imprisonment by Milan Nedich, and his emergence as a resistance leader in 1941. 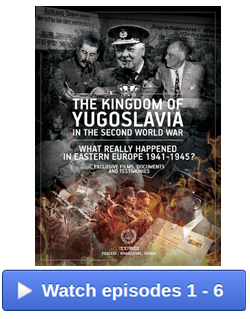 "For over a year he has defied Hitler and his armies--and kept Yugoslavia unconquered." 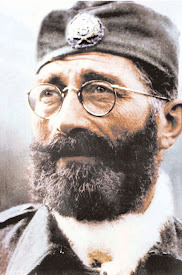 He launched a resistance movement that was unprecedented: "Yugoslavia ... is the only conquered country in Europe that will not bow down to Hitler!" The story opens with his swearing in as Minister of War: "I, Draja Mihaiilovitch, promise to carry out the duties of my office until death---or until my country is freed of the invader!" Then he is shown at 15, joining in World War I "to fight for Balkan independence". He is wounded three times. After the war he advocates guerrilla tactics: "Modern war can't be fought with old-fashioned tactics! Guerilla warfare is the only answer" As a colonel he becomes the youngest officer on the General Staff. He is court-martialed and imprisoned by Milan Nedich for his criticisms of Yugoslav defenses. The Germans bomb and invade Yugoslavia on April 6, 1941, Palm Sunday: "The Nazis bombed Belgrade for eight hours and killed 20,000 persons!" 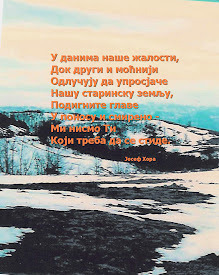 The Yugoslav slogan was: "Rather war than a shameful pact! Rather death than slavery!" After the surrender of Yugoslavia, Mihailovich maintained: "I'm staying--to organize a guerilla army to fight the Nazis!" He created an army in the mountains to "fight for freedom". 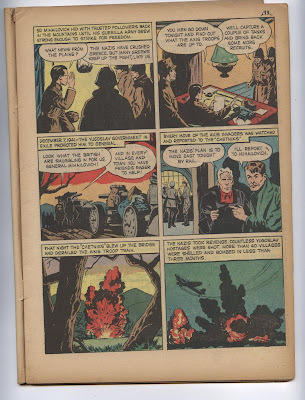 The comic focuses on his guerrilla activities against the German occupation forces, blowing up railroad bridges, attacking German troop columns, derailing trains, engaging in sabotage, and organizing a massive popular resistance movement. The guerrillas were fighting in "our own style". The Germans retaliated by executing 50 civilians. They placed a reward of a million dollars for his capture, dead or alive. Mihailovich created his own small air force. They tied down 18 German divisions. The Germans stated that they had lost 50,000 men in Yugoslavia and needed seven new divisions from Germany. Bulgarian troops attack the Chetniks but are defeated. Moreover, the Nazis have taken 16,000 Yugoslav civilians as hostages and have arrested their relatives. Mihailovich, however, refuses to surrender: "Freedom does not come easy!" 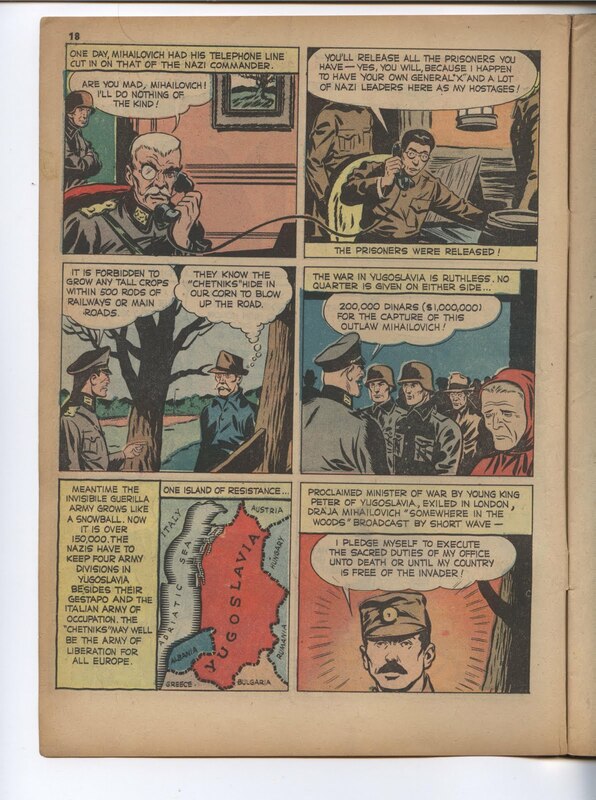 In the concluding scene, Mihailovich is shown defiant and victorious: "Outwitting Hitler at every step, inspiring his people, and setting an example to the rest of the world, the great General Draja Mihailovitch, commander-in-chief of the Yugoslav Army and Minister of War--fights on!" 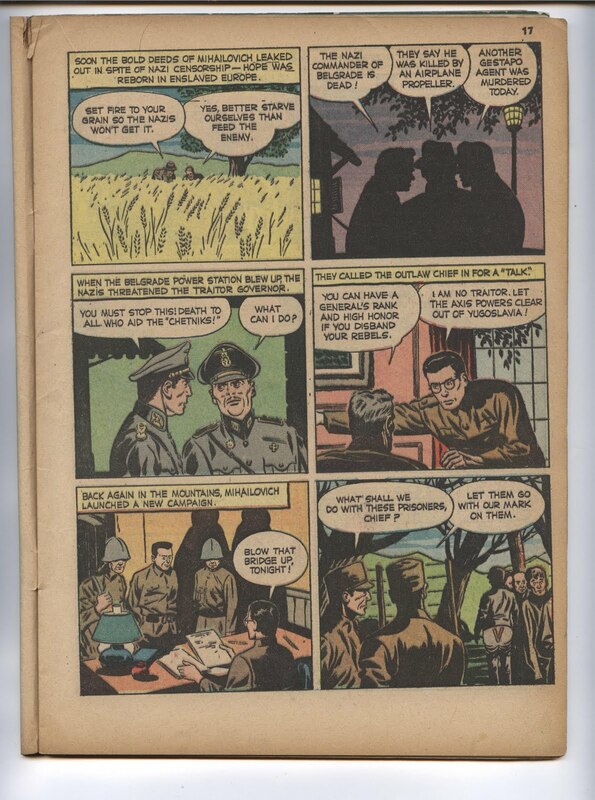 6) Prize Comics, #20, March, 1942, “The Chetniks”, Ted O’Neil of the R.A.F., pages 20-25, Prize. During World War II, Draza Mihailovich and the Chetnik guerrillas caught the American public imagination like few others before and since and became ingrained in American popular culture. They became icons and superheroes whose exploits became the stuff of legend and myth as they themselves became heroes in comic books. JUST CLICK ON EACH AS YOU ARE READING.